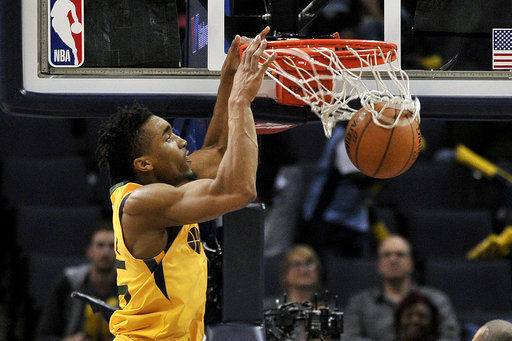 MEMPHIS, Tenn. (AP) — The Utah Jazz are putting together overall winning streaks with an even longer stretch of success on the road. 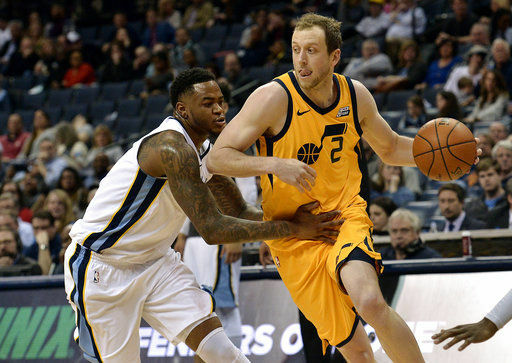 The Memphis Grizzlies simply aren’t winning anywhere. Utah won its fifth consecutive game and 10th in a row on the road Friday night, as Jae Crowder scored a season-high 22 points in a 95-78 victory over the Grizzlies. The loss was the 16th straight for Memphis. 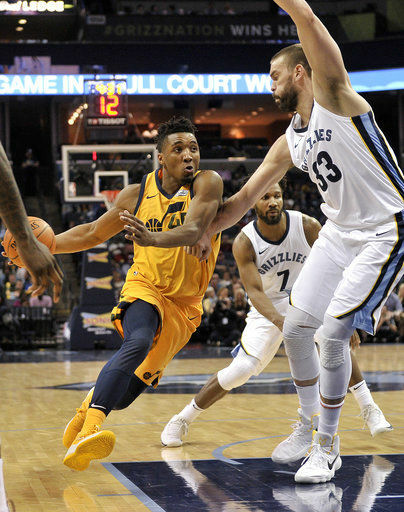 The game was an example of the differing directions for the two teams — the Jazz trying to hold onto their postseason position, the Grizzlies dealing with injuries and using younger players while owning the worst record in the NBA. Utah held onto the Western Conference’s final playoff spot. The Jazz entered the night a half-game ahead of the Los Angeles Clippers and the Denver Nuggets. Nothing is pretty for the Grizzlies right now. There are bright spots. Dillon Brooks led Memphis with 18 points, his second straight game leading the team in scoring. Ben McLemore finished with 14, while Jarell Martin contributed 13, making only five of his 15 shots as Memphis shot 37 percent for the game. Memphis lost track of the Jazz when Utah went on a 14-2 run over the final 6 minutes of the second quarter. That helped Utah carry a 50-38 lead into the break. Utah didn’t trail in the second half and was never in any real danger of losing the lead after a short opening burst by Memphis to open the second half. Once the Jazz stemmed that rally, the advantage never dropped below eight points. Jazz: Donovan Mitchell, who was held to nine points in a Feb. 7 game against Memphis, managed 12 points Friday. He entered the game averaging 23.2 points in 11 games since the Feb. 7 single-digit effort. “Donovan has to play better,” Snyder said. “He had a few decisions he can improve on, and he will.”… Rudy Gobert, who entered the game averaging 21.5 points and 14.8 rebounds over the winning streak, had four points and 10 rebounds. Grizzlies: Have held the Jazz under 100 points in all of the last 28 meetings between the teams. … Gasol had nine points and 11 rebounds. … Grizzlies are now winless in 16 games this season without Tyreke Evans. Evans missed his eighth straight game with a right rib injury. 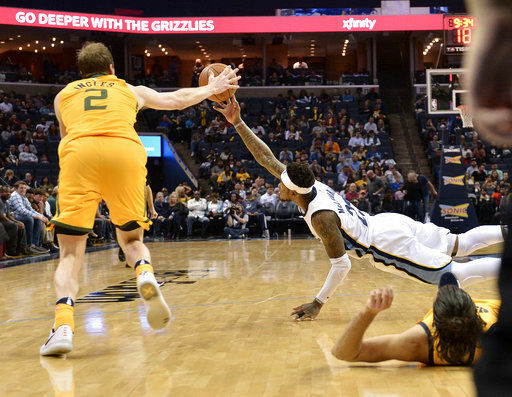 With the 16th straight loss, the Grizzlies have the longest losing streak in the history of pro basketball in Memphis. The 15 losses before Friday night matched the longest skid by the Memphis Tams of the old American Basketball Association, who lost 15 straight during the 1972-73 season. Crowder converted 6 of 11 from 3-point range, a career best in 3-pointers made and attempted. “I thought (Crowder) could have had even more of them,” Snyder said. “There were a couple of times he was in the open and we missed him.” The Jazz finished the night 13 of 32 from outside the arc. Jazz: Face the Pelicans in New Orleans on Sunday. Grizzlies: Visit the Dallas Mavericks on Saturday night.